Neno moja tu : shukrani! Zawadi nzuri kwa ajili ya Mwaka Mpya. Nakutakia heri na nafaka nyingi katika huu mwaka mpya. 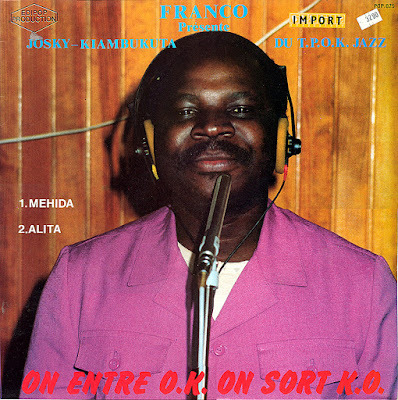 Uendelee kutupatia muziki mtamu kama wa Franco na Cie.
`Limbisa ngai`, an irresistable, really irresistable masterpiece track indeed!! Thank you so much for sharing with us this gem. It's a great way to start the musical year. Limbisa ngai is indeed irresistable! Does anyone know this African soukous track below from 1983? @ John Peel: The song is "Tatukama" by Prince Lessa Lassan. See this post. Yes, yes, yes, LOVE this album (and Josky's voice): https://cavacha.wordpress.com/2015/04/17/liner-notes-episode-4-i-love-josky/. Thank you for all the background details!